Innovative electronic duo Fluida began their musical journey as instrumentalists: the pair originally played bass and drums before deciding to direct their interweaving rhythms deeper onto the dancefloor, embracing the impulsive energy of dance music and creating a unique synergy of acoustic tones and electronic sequences. Traversing between headphone listening and euphoric dancefloor journeys, their music manages to be both club-focused and deeply emotive, creating a breadth and depth of sound that connects with people both in the early evening and at those special sunrise moments in the early hours. Following several multicoloured ‘Spiral’ releases on Fatboy Slim’s Southern Fried Records, the pair quickly garnered diverse support across the board from DJ’s such as Joris Voorn, Sasha, Roger Sanchez, Matthias Meyer, Lee Burridge, Tiesto, Audiofly, Izhevsky, Kölsch and Pete Tong. 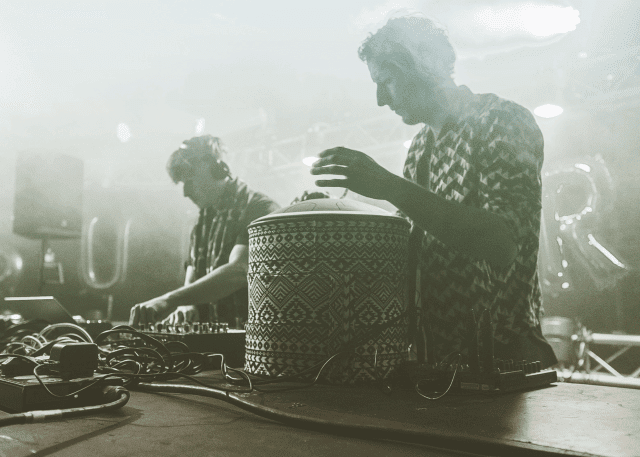 Anjunadeep gave the duo an outlet for some of their deeper releases, whilst collaborations with Aero Manyelo on Get Physical showcased the percussive and tribal elements of their sound. Fluida have appeared in many of London’s finest venues such as Bloc & Village Underground as well as enjoying time at some of the more secretive raves you can find in the woodlands and warehouses of the city. Sticking to their roots as live performers, Fluida’s hybrid live-DJ sets, built entirely from their own material, incorporate the steel pan ‘hang drum’ that features heavily across their discography. This live instrument’s presence in the DJ booth offers a unique energy and an immediate connection with the audience. In addition to frequent live performances, the pair regularly broadcast their eclectic tastes across the airwaves through radio slots on Bloop London and Ibiza Sonica. The pair’s latest offering, ‘Tongue Tab’, lands on the newly re-launched Supernature on Oct 8th, soon to be followed by hotly-anticipated tracks on Do Not Sit On The Furniture and Get Physical.